When you want a choice of non-alcoholic drinks it can be hard to find something that tastes like a treat whilst not being too sweet. A long time ago I tried two alcohol free beers, they were both horrible, hence I’ve never been tempted to try any since. That is until last month when I picked up a bottle of Brewdog ‘Nanny State’ beer to read the label, I assumed it was another in the Brewdog range of craft beers. It was only then that I realised it was alcohol free. Well the name should have been a clue! Certainly an inspired name choice which made me smile as soon as I realised my mistake. Still not convinced that it could be worth buying, I had skirted around it on the beer aisles for a few weeks, but then determined to be openminded decided to try one. Well it proved to be third time lucky. I was peasantry surprised, the smell was invitingly of ‘proper beer‘ and the taste was certainly craft beery. A nice hoppy bitterness, with none of the yukky flat after-taste I remember. 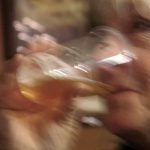 Since trying Brewdog’s Nanny State I was told about this excellent website – and yes of course Nanny State is on their non-alcoholic drinks list. Such a good idea, The people at Dry Drinker do all the hard work of sourcing for you and only sell what they have actually tried. There is definitely a need for some more sophisticated non-alcoholic drinks. I was heartened last summer to read an article by Victoria Moore about a new family of non alcoholic drinks, which sound very grown up. More along the lines of non-alcoholic G & T’s, they sound tempting. At the moment finding them seems to be the hardest part, hence so far no luck. Before buying a bottle it would be nice to try a glass to see if we really like it or perhaps which one we would prefer. They don’t seem to be on offer in pubs. but I will keep looking out for them. Meanwhile this month the hops also had their thirst quenched! Finally it rained, at last they had the good soaking they badly needed, it was getting pretty dire especially for the young ones. 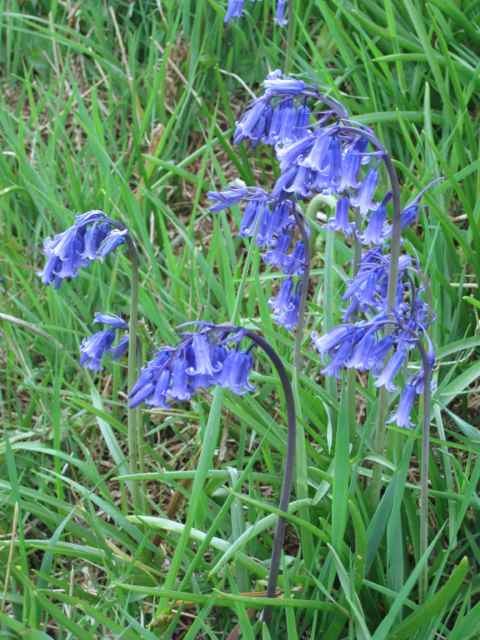 The combination of the dry soil and cold night temperatures including a frost in April had put the brake on their normal rapid Spring growth. However, now that’s all changed, the hops will soon be rapidly climbing the strings. 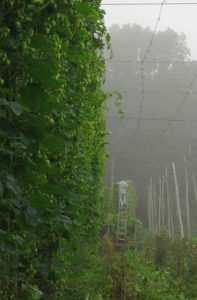 Growing hops at home is not much different to growing hops commercially on a larger scale, but at home it is just much easier to pamper a single plant. Here we have had no rain. Nil, zilch, nada, nothing, nothing at all, not even to lay the dust let alone enough to soak the ground. The ground is seriously dry. 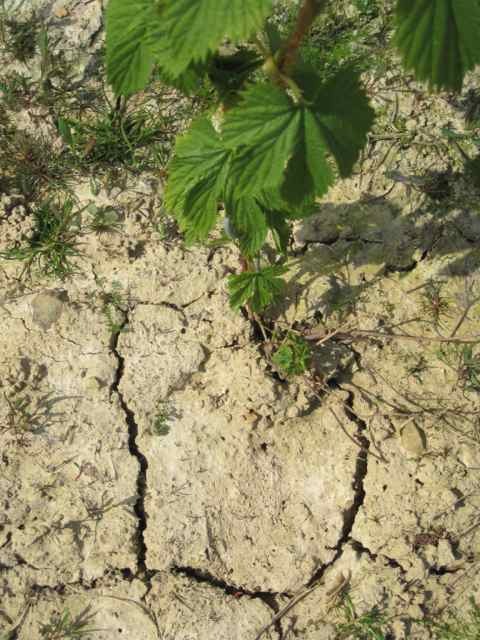 Our clay loam soil is now badly cracked and unkind for any spring grown crop. 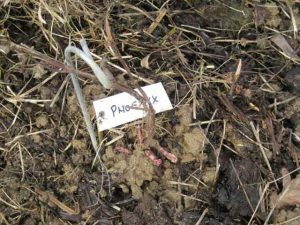 The soil was wonderfully friable for planting hops setts this February with one well timed wet day shortly after planting to settle them in nicely. But, since then no follow-up rains have materialised. We have watched the skies hopefully on days when shower clouds gathered, but each time we have had to watch as every shower circled right around us. Hop growing can be a frustrating business. Usually, with us anyway, first year hops are not watered. Originally it may well have been partly due to logistics of large scale irrigation but mainly because the theory is that their roots will go down deeper after the moisture if they are not watered. 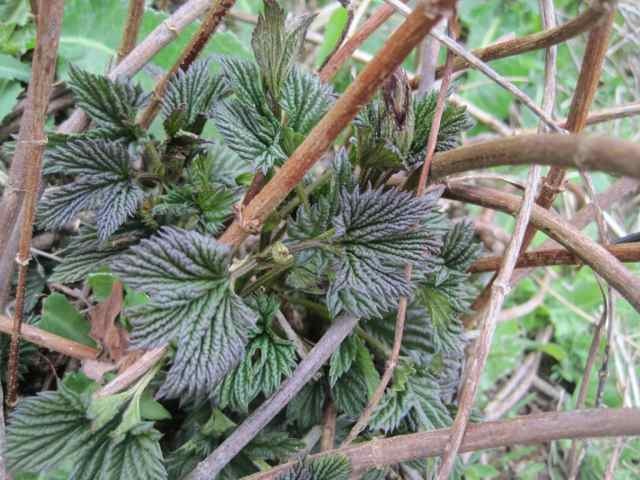 I try to follow that reasoning as much as possible however, this year I had some smaller pot-grown hop setts as well as the usual Grade 1 setts suppled by Stephen Wright. 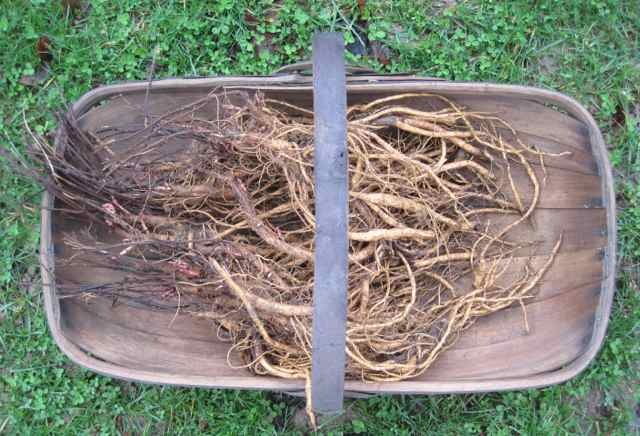 The root systems of these pot-grown plants were naturally not as robust as the hunky soil grown setts. So yesterday I gave in and watered some of this year’s babies. They were not stressed but I didn’t want to risk leaving them any longer. 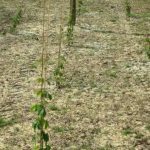 Watering is one example when growing hops at home is much much easier! 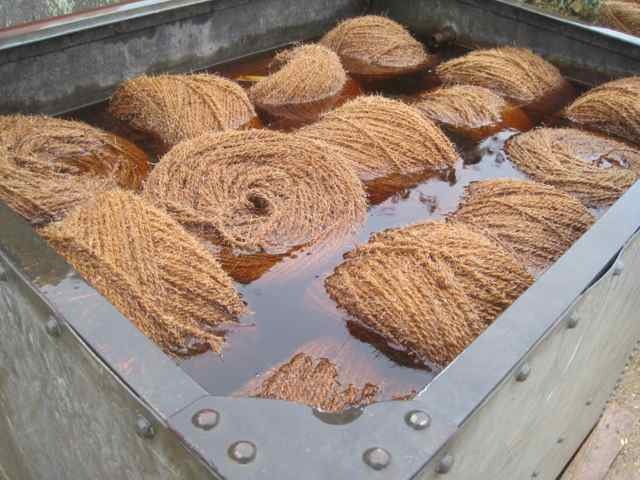 Each plant was given a long slow watering of a gallon each, allowing it to soak in well. 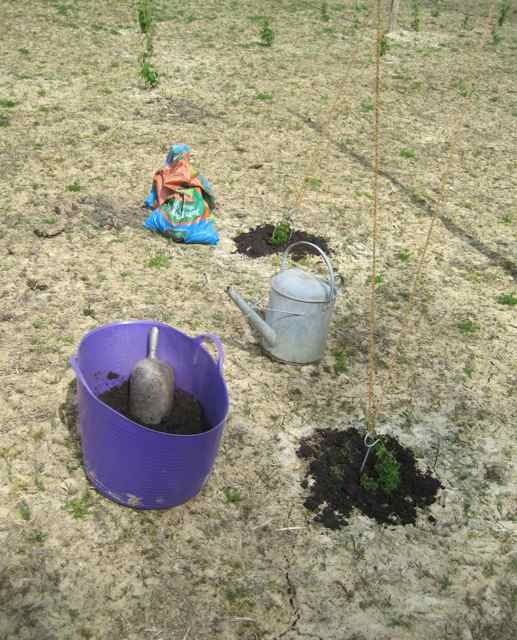 I had mixed in a little propriety general liquid fertiliser to help give them a gentle nudge, then back-filled the cracks with John Innes No3. I feel this helps stop any evaporation post their watering, which makes me feel better if nothing else. A good soaking is the important thing, rather than just damping the surface, giving a little water would do more harm than good by encouraging the roots to stay on the surface. Hopefully we will soon have a good rain soon to even up soil’s moisture content. The other larger Grade 1 setts I have left for a while longer, they are growing well and will not be picked this year anyway. 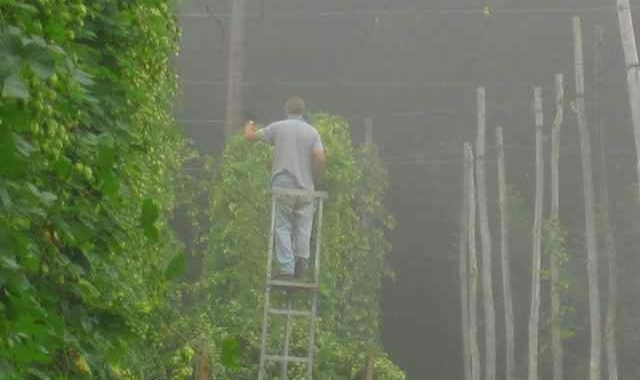 Rather than cut 1st year hops for picking in September, by to allowing them to die back naturally, they can continue growing over a longer time span during October. This helps establish their root systems for next season. Maybe this and old wives tale but it feels right. 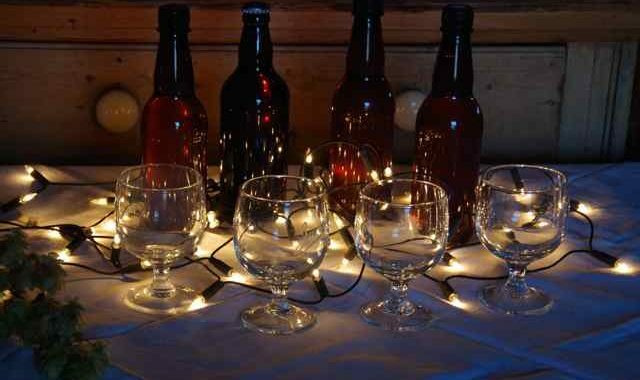 If you are a home brewer and always fancied making a green hopped beer, it is certainly worth considering growing hops at home. If short of space perhaps you could squeeze in just a single plant of your favourite variety. 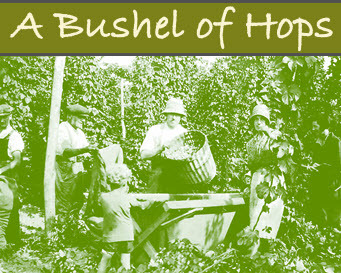 You could then have the pleasure of picking your very own hops with no worries about drying them. Bramling Cross Hop variety was bred by Professor Ernest Salmon at Wye college then released in 1951 after trials. 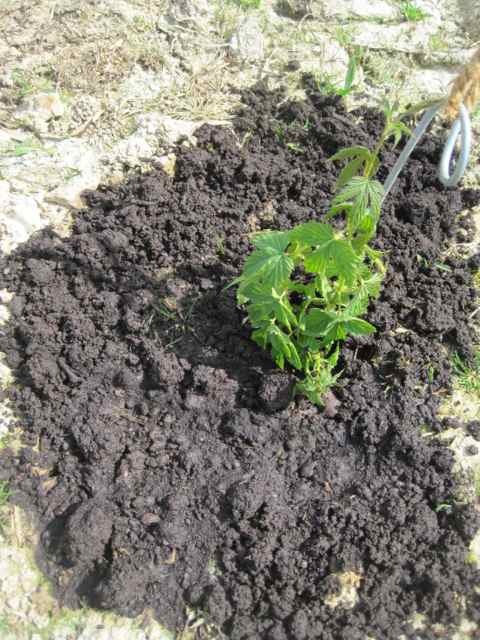 It’s mother was a Bramling Golding and the father a wild Canadian Manitoban hop seedling. Demure fresh-faced Kent maiden meets wild Davy Crocket look alike! The outcome of this liaison, the Bramling Cross hop variety takes after both parents, this makes for an interesting combination. The aroma is said to be American, whilst it’s neat growth takes after it’s Kentish mother by producing ladylike columns of very pretty hops. 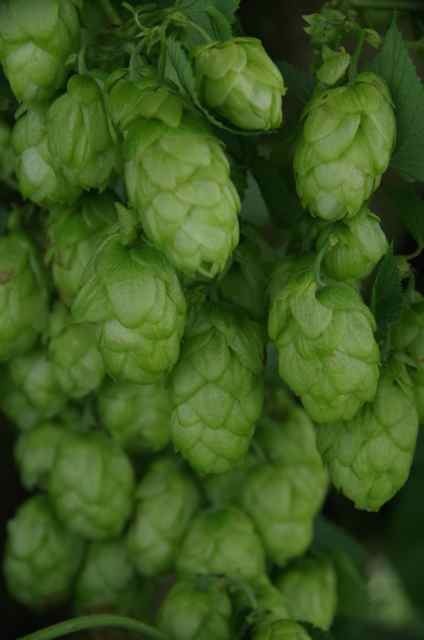 In full hop this is a beautiful plant as well as being an easy well-mannered hop variety to pick. It is one of the best bines to hang up for decoration. 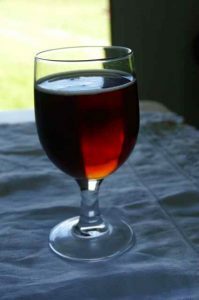 The Bramling Cross hop is well thought of with mainstream Brewers being used for both late and dry hopping and known for its good bittering flavours. Brooklyn Brewery and Harvey’s Brewery have both used this variety. Another testament to its brewing prowess is Brew Dog naming it as one of their favourite hops. That being said it doesn’t seem generally popular with home-brewers. For home-brewers it appears to be very much a ‘love it or loathe it’ variety, and mostly ‘loathe it’, a real marmite hop! I even read one forum comment about it smelling of old trainers. 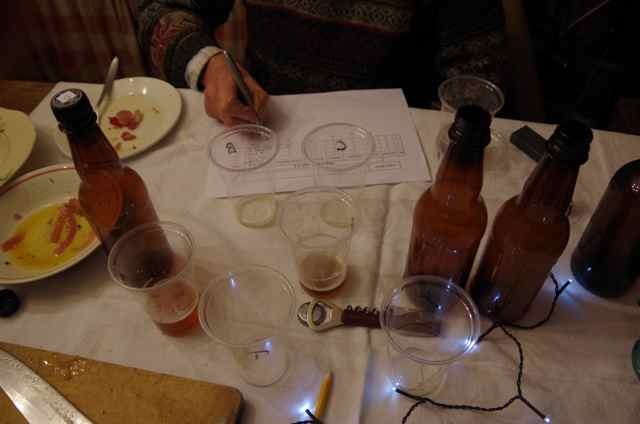 I do not know why people think it would have a bad pong, whilst someone may not like the smell of hops, the actual hops themselves should never smell bad. The only conclusion we can draw is that that particular sample must have been old or had been poorly stored. Once the oils within a hop cone turn rancid, this will make any variety smell ‘cheesy’, indeed any oily food would taste unpleasant if this happened. 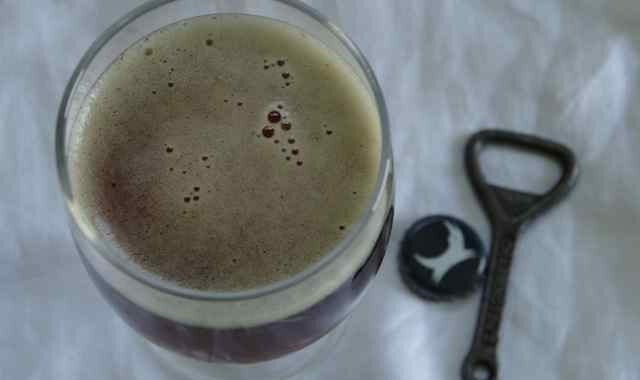 However, the fresh aroma of the Bramling Cross hop could not be more strikingly different, it is a spicy dark berry delight. The bouquet is predominantly blackcurrants with added citrussy lemon notes plus a hint of vanilla for good measure. Any whiff of cheesy feet means the hops have gone ‘off’. I do not sell hops from a previous season and can only recommend that they are purchased as soon after harvest as possible. 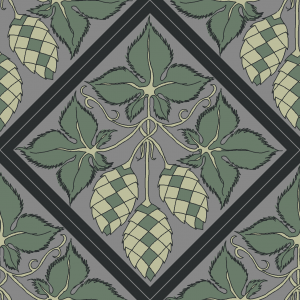 ‘Fresh is Best‘, hence I made a commitment to home-brewers that I will only ever sell hops from the current season. Any left over stock at end of each August is destroyed. However, whichever the side of the ‘marmite’ fence you are on, for Bramling Cross devotees use them while you can, there is every possibility they may not be around commercially in the future. For growers, the Bramling Cross hop variety is certainly giving us cause for concern. It has thrown up a double conundrum. 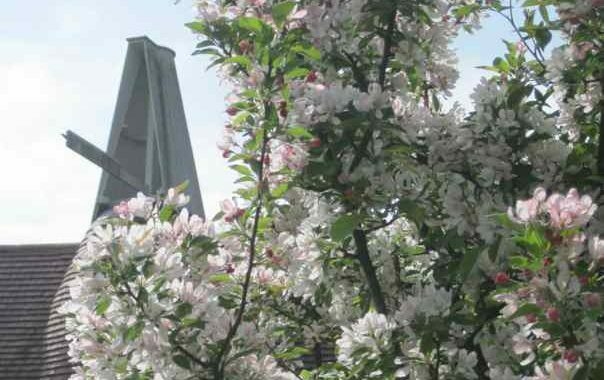 The theory is that Bramling Cross is particularly sensitive to global warming, it truly does appear to be affected by climate change, and as such it could be a climate indicator plant. 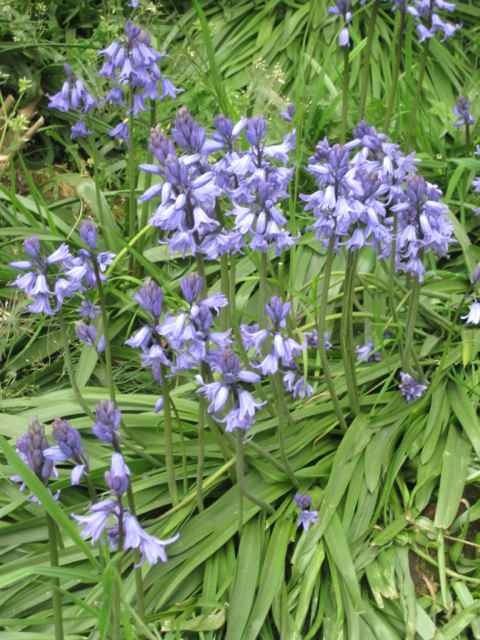 Although an old variety the mild, often wet winters we have been experiencing of recent years just do not suit them. Current thinking is warmer winter temperatures mean that the plants do not go into dormancy properly and then simple refuse to grow in the spring. It is a scary phenomena to witness, you cannot force them to grow, therefore growers are basically helpless bystanders, there is nothing whatsoever you can do about it. Some years it has been mid-June when we have trained them for the first time and even then the growth can be very uneven, this alone is never a good sign. It also makes their management more tricky. Other varieties are heading skywards over the top wires, whilst the Bramling Cross hop variety stubbornly refuses to budge. Some growers have grubbed hop gardens as this variety becomes more and more uneconomical to grow. This past winter 2016/17 we have had periods of frosty weather in the SE, it remains to be seen if this is enough and whether they grow away any better this Spring. 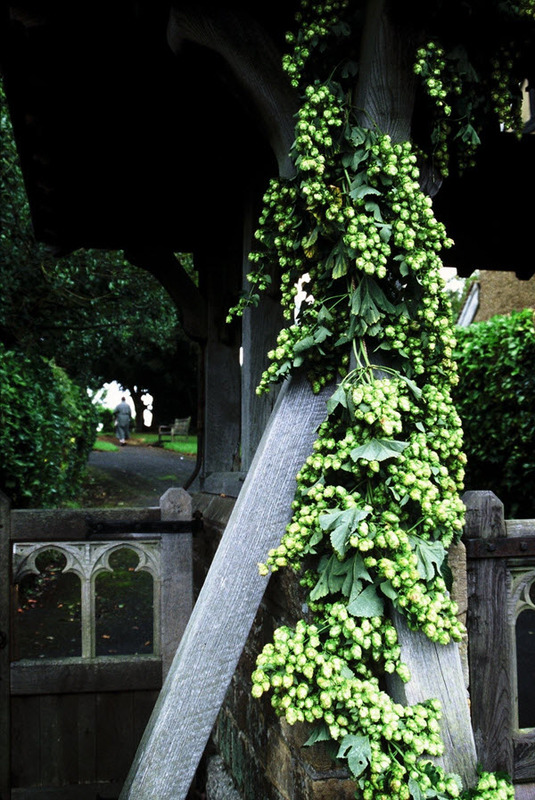 However late Bramling Cross start into growth, being an early variety, ironically they are always the first hop variety to be picked, certainly in this area and therein lies their second weakness. 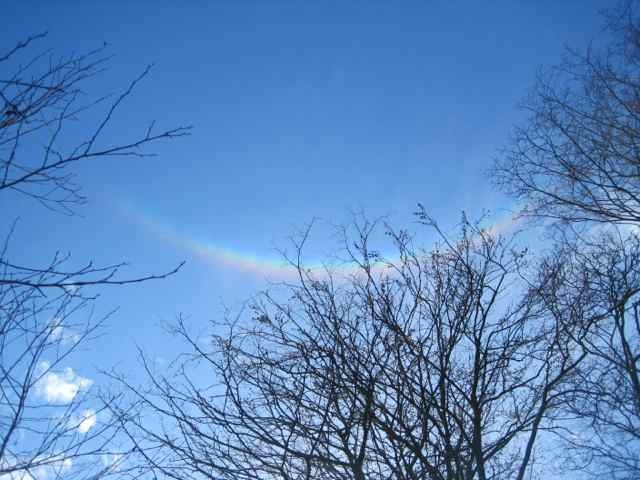 This is the double whammy, it means their growing season is shortened. 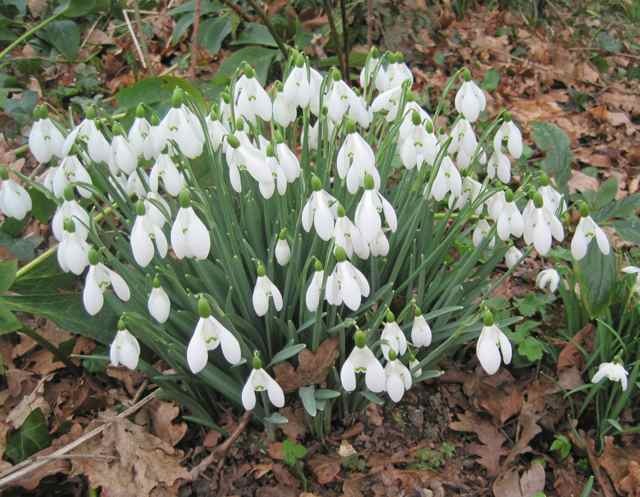 It is entirely feasible that if this continues year after year, then the accumulative effect will mean that plants cannot replenish their own strength within this pared back growing season. There could come a time as they become weaker and weaker that they will naturally die out. Last year I noticed their bines were much finer than ever before. On that gloomy note and still on the subject of blackcurrants, I had heard that blackcurrant leaves make an excellent tea. Last summer I tried it – a handful of fresh young leaves into boiling water. I don’t much like fruit or herbal teas, preferring good old fashioned builders tea, however, this time the advise given was quite correct. The leaves alone smell inviting, Blackcurrant leaf tea does make for an excellent cuppa and apparently very good for you too! I’ll end with the counsel given by the Abbé P. Bailly de Montaran in 1712, “There is nobody who, having a garden, shouldn’t plant a great number of black currant bushes for the needs of their family,” Hear hear to that you can use the leaves and berries. This year’s hop setts have arrived just in time to coincide with the arrival of storm Doris tomorrow! That will probably delay planting for 24 hours, but we planted several out today and the rest are now safely bedded-in until Doris passes. I love baby hops and as always these setts from Stephen Wright are superbly grown. 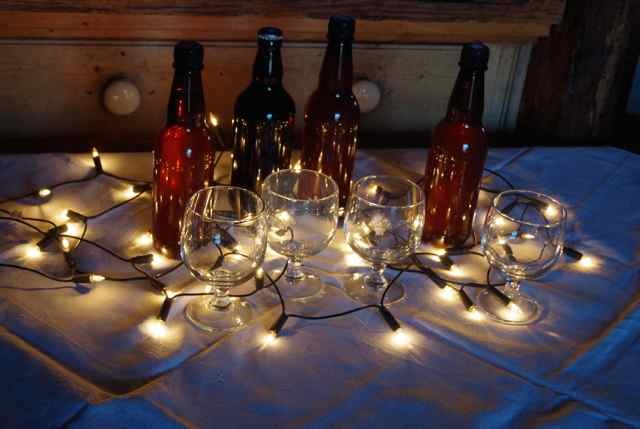 We have the more popular varieties already growing which we wanted to bulk up, but also 2 ‘brand new to us’ varieties for the home brewer to try. Hopefully these new additions to our range for 2017 harvest will whet a few appetites; well certainly enough to give them a try in a brew. 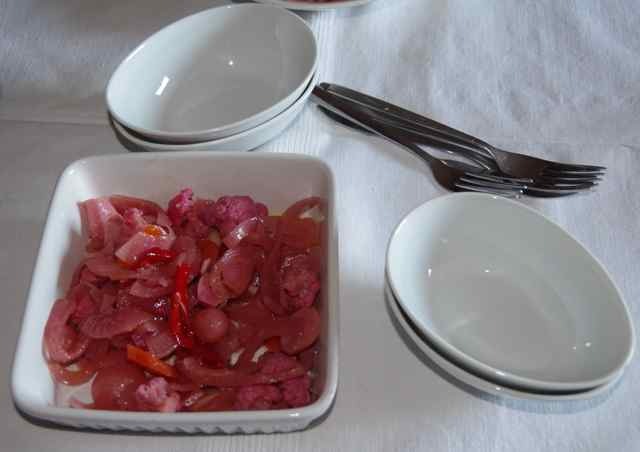 There should also be 2 Heritage varieties on offer this year. But I will wait until closer to harvest to select which two will be listed. This year’s 2 new additions to our range are Willamette and Perle. I am now really looking forward to seeing how they grow this season. Snow drops are out, a few early daffodils along sunny banks and the hellebores are as stunning as ever. 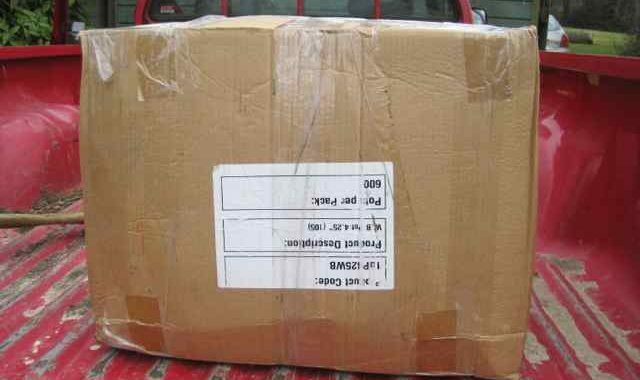 This year’s hop setts have arrived, hurray Spring is not far off. A new hop growing season begins. In this area hop stringing has just started. I love this fresh ‘new-page-in-a-note-book’ feeling, with the accompanying expectation that as a new hop growing season begins, this is it, this year there’ll be a perfect hop crop! Of course we know reality will not be like that! Each season always turns out to be very different to the last one and just when you think you have things sorted, along comes a completely different set of problems to keep everyone on their toes. But just for now we can dream a little, it will all be perfect! Hop string soaking before being put on wet. If it was put on dry it would stretch when it rained. Bines have been cut off and burnt up, winter wire working is complete, allowing this tentative beginning to hop stringing. This job is weather dependent therefore can continue in fits and starts over the next 3 months. Banding follows on as soon as each garden is strung. Below the first strings silhouetted against a wintry sky. 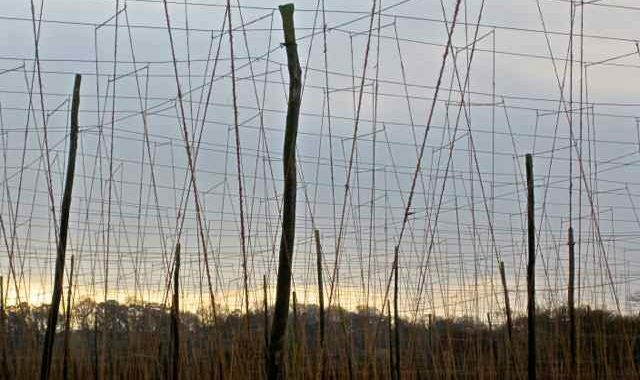 Stringing at A Bushel of Hops will not get underway until after this year’s new varieties have been planted. The screw pegs will go in as each hop sett is planted, each screw peg is needed to be in place before any string can be put onto that garden. What makes this crop so exciting is within 6 months these plants will emerge from the bare soil, they will grow to 16 foot and be harvested. Zero to hero! 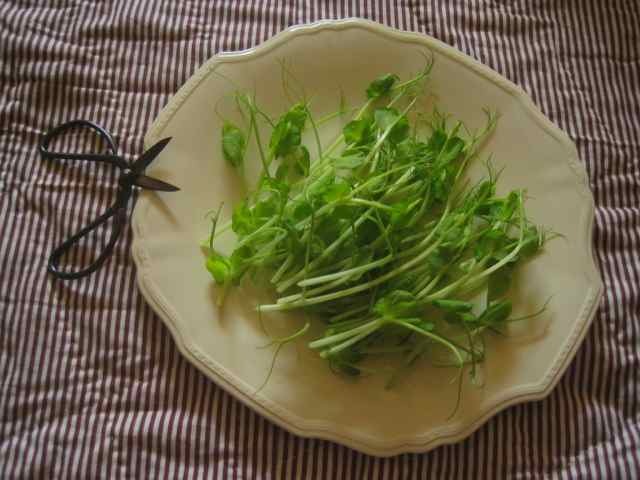 Fresh pea shoots are a tasty salad addition at any time of year but especially during chilly grey winter months when fresh salad greens are at their scarcest. These crisp shoots with their fresh pea flavour instantly transport you to summer days with memories of picking peas and eating them straight out of the pod. Having seen them available on supermarket shelves I found it was super easy to grow them at home and have them ready to cut as required. 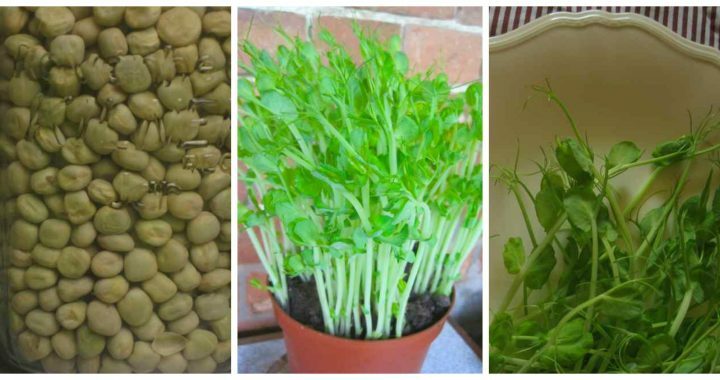 Simply buy a pack of any dried marrow fat peas normally used for making soup*, I soak a good handful for about 5 hours, then sow them thickly onto fresh compost in any handy sized flower pot. They want to be just below the top of the pot and by having the seeds touching each this seems best for a good density of shoots. But really adjust to suit your own preferences. Cover with a thin layer of compost and tap the pot on the table to settle the contents and that’s it. Water the pot, then stand indoors on a window ledge, it does not matter if it is north facing and gets no sun at all. 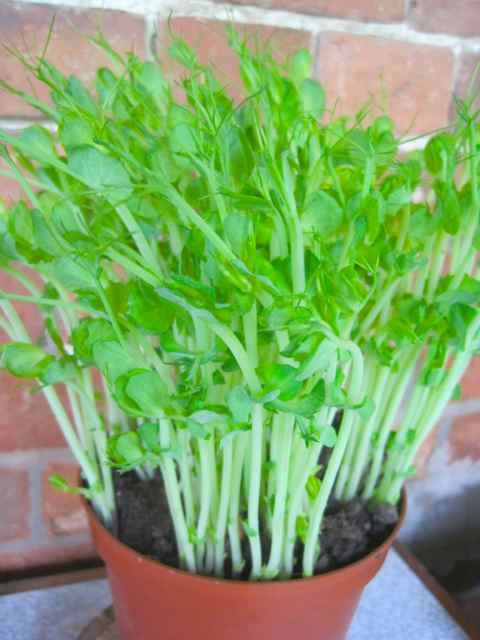 Unlike planting seeds which are to be grown on in the garden, you actually want these shoots to draw up to be tall and leggy. Keep an eye on the pot so as not to let the soil dry out, I leave it close to my washing up area so it is easy to see, then once the shoots are growing turn the pot regularly. That way the shoots will grow straighter and not make a horizontal dash for the window pane! I like to leave them until they get their first curly tendrils, there’s no difference to the flavour but they look pretty. That is all there is to it, green fingers definitely not essential! Next bit is the best bit and even easier, just cut as required, a quick rinse and that’s it, a little bit of summer on your plate. Let them grow back a second time after their first hair cut. They are not as tall or perfect this second time around but that is fine, they still have that wonderful fresh pea flavour and crunch. Delicious! 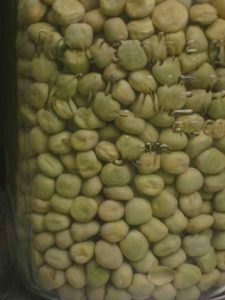 *Caution – use only peas sold for cooking, DO NOT use peas that are sold for sowing in the garden, these may have protective chemical dressings on the seed. 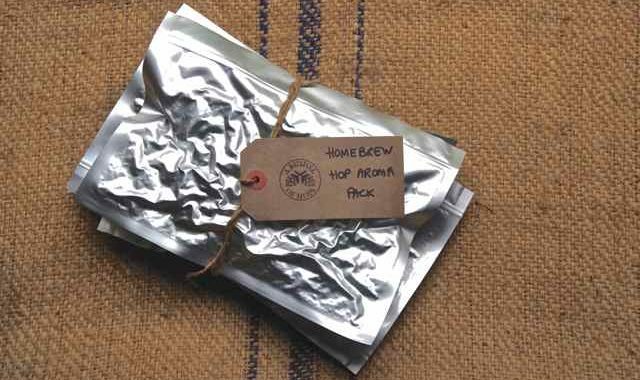 ‘The Homebrew Hop Aroma Pack ‘ draw is now closed. We are delighted to announce the winner has been randomly selected and is ………………..James D.
Congratulations James. You will be getting an email shortly. We had 42 entries in all, thank you so much to everyone who entered. Winter hop gardens and it’s wire working time once again. 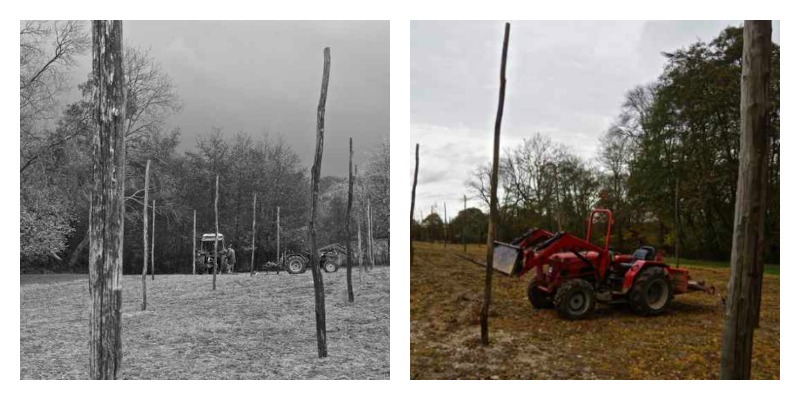 This mean any of the following, from replacing hop poles that were broken during hop picking, to checking all running wires, bearing wires, curbs and anchors. 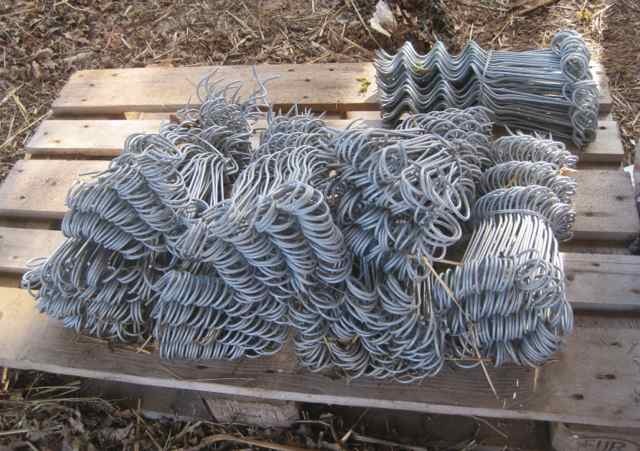 Sections of wire that have become slack from the weight of the crop can be tightened and individual broken wires replaced. 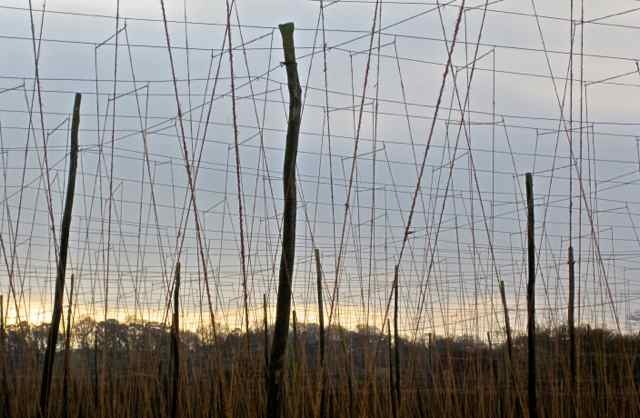 Whilst Painting the Forth Bridge may now be complete for the next 25 years, in the hop gardens wire working maintenance is still a continually ongoing enterprise. 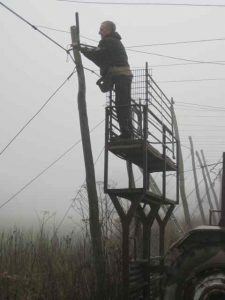 Generally a small area of top wire is selected annually to be replaced, eventually needing to be redone once you have got to the end! It is good to get as many of these jobs done as possible before the ground becomes too wet or the real chill of mid-winter sets in. Like most outdoor work it is simply easier to move without needing to wear lots of layers to keep warm. 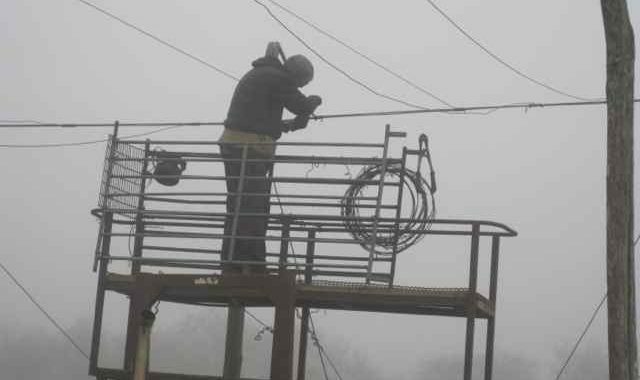 However, tightening the wires means it is difficult to wear gloves while doing this and chilly hands can be an occupational hazard. The obvious difference in the wires before and after tensioning is shown below. 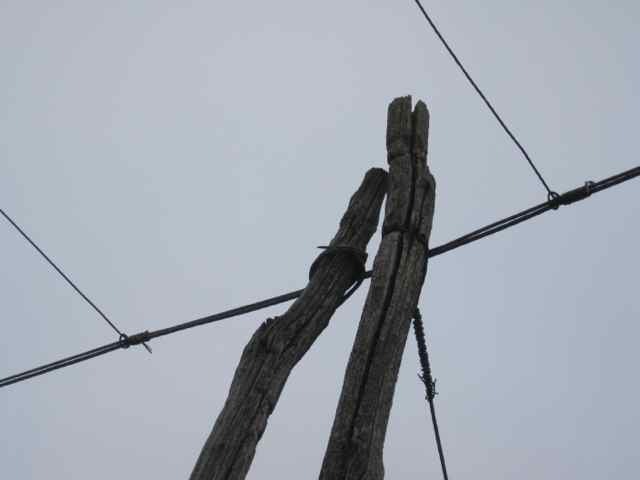 Still the old poles but freshly tightened running wires neatly wound off. 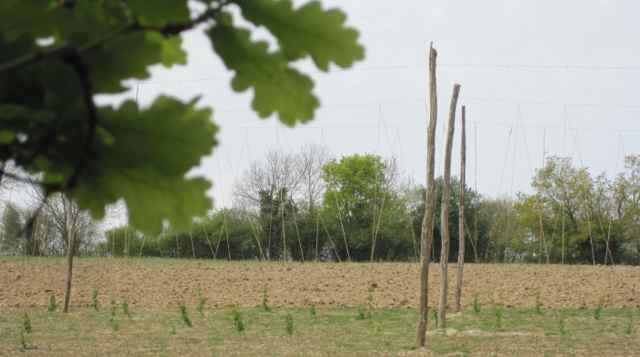 While the ground was still dry a small area of poles were augured in place ready for the top wires and anchors to be attached later. This garden will be ready for setts to be planted out later this winter. 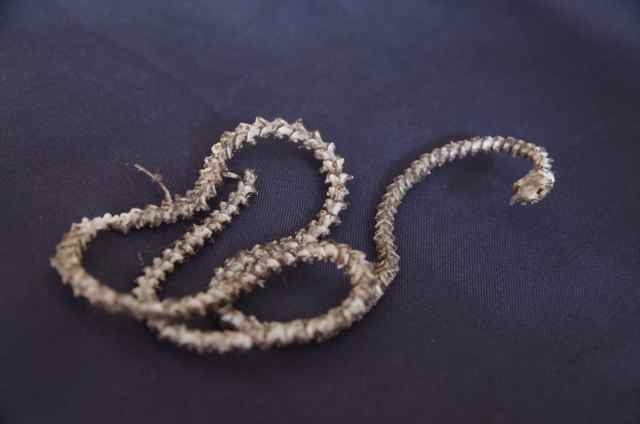 A few winters ago while moving a pile of wood, underneath I found this perfectly preserved skeleton, by it’s size I presumed it was a grass snake. Although I am not keen on snakes, as this one couldn’t move it was fascinating to examine closely. It was flawless and I am pleased to say it eventually found a good home in a nature cabinet. Still on snakes I was given an unusual curio by an Australian friend, I cannot really call it a gift, of a bone with individual vertebra from a snake glued around it. Once painted they look like little people singing from very large song books. I came across it the other day and could not believe I still had it! 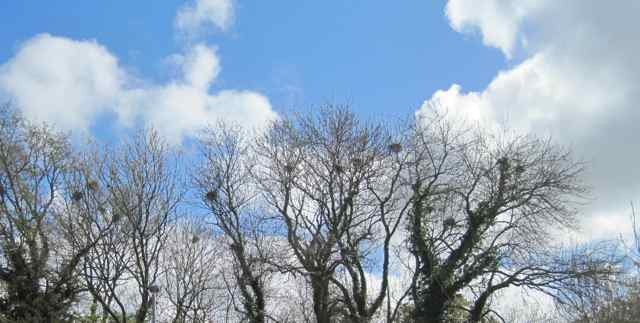 However, the bare-bones I most enjoy are our trees in winter when leaves have fallen and they can reveal their basic structure. Silhouetted against a wintery sky and surrounded by plants laced with hoar frost, I love a proper winter.